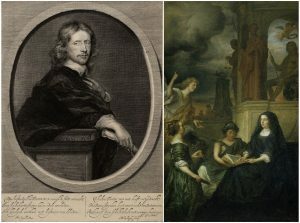 One of the largest paintings in the Galerij Prins Willem V is Govert Flinck’s 1654 signed and dated “Allegory on the memory of Frederik Hendrik, prince of Orange, with the portrait of his widow Amalia van Solms”. In the foreground the princess in mourning clothes is holding an open book on her lap. In addition several allegorical figures fill this over-obvious and rather pompous scene with a palm branch, an anchor and a blooming orange branch. An angel is pointing upwards, referring to the grave monument in the background with a sitting Frederik Hendrik in armor, with above his head of course a descending putto holding a laurel wreath. Although born in Kleve, Govert Flinck (1615-1660) became one of the most celebrated painters and prominent portraitists of his time in Amsterdam. 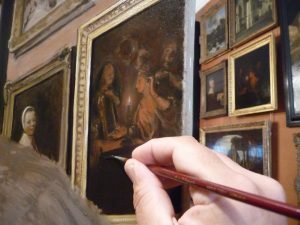 Even today he is regarded as one of Rembrandt’s most famous and gifted pupils, who could imitate his master’s style so diligently that for centuries many of Flinck’s works have been wrongfully attributed to Rembrandt. Already during his lifetime, his fame had by far exceeded that of his teacher. His commissioning customers included not only Amsterdam’s patricians and magistracy, but also the House of Orange, the House of Brandenburg and the Kleve Governor Johan-Maurits, Prince of Nassau-Siegen, who, to complete also this circle of history, between 1633 and 1644 built a stately house in Den Haag that since 1822 we know as a museum called Mauritshuis. Due to its size and position to the sharp light coming from the chandeliers as well as the incoming daylight from the windows, seen from Klarenbeek’s view point most of the imagery of this painting disappears behind strong light reflections, which, considering his opinion about the painting, he doesn’t really mind. Whatever visible is faithfully depicted as such in his wet oil paint. Both of the painted glass chandeliers once were prominently visible in the ‘doodverf’ stage, but have since then partially been covered by some of the recently depicted paintings on the south wall. 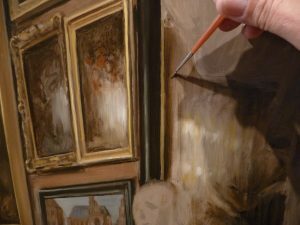 At a later stage, these dominant light sources will return in the painting, of course in their turn covering whatever is there to be seen now. 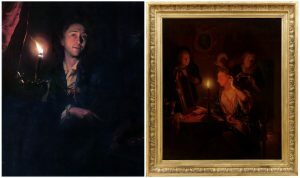 The during his lifetime highly sought after genre and portrait painter Godfried Schalcken (1643-1706) received his education from the former Rembrandt pupils Samuel van Hoogstraten in Dordrecht and Gerrit Dou in Leiden, and later became specialized in ‘nachtstukken bij kaerslicht’, (= night scenes lit by candlelight). He was noted for his mastery in specifically reproducing the various light effects of candles in obscured spaces, and painted in an exquisite and highly polished manner. Because of that specialism, his rising fame even brought him to England, where he has been working for a few years as well, but his apparently uncouth manners and bad temper alienated him form society there. After his return he settled in Den Haag, until his death, aged sixty three. The last quartet paintings on the gallery wall to be included in the new CONTERFEYTER painting are, above and next to the already mentioned candlelight scene of Godfried Schalken, a waterfall landscape by Jacob van Ruysdael, a Delft church interior by Hendrick van Vliet and a attractive child’s portrait, attributed to Albert Cuyp, depicting a young girl whose cheeks look even more pinkish than the fresh peaches she is carefully holding up for us in her basket. Because these four paintings are closest to the viewing point and thus to the spectator, they also will have to be depicted most in focus. The aforementioned rules of the different types of perspective indicate that this part of the painting should be executed in a more detailled manner and must also contain the most pronounced colors, the sharpest contours as well as the most distinctive ‘impasto’ (= thickly applied opaque paint). Art is not about following rules, but of course, you must know the rules first to be able to break them efficiently. Now that all elements of the gallery interior have been painted in, it has become time to end this working period in the museum. 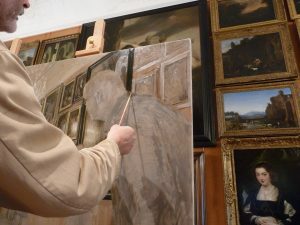 Early Monday morning, August 14th, the canvas was carefully taken off the studio easel and transported back to the CONTERFEYTER studio, together with all the other working materials of the dismantled painter’s open studio space in the gallery. From this point, again many thanks to the directorate and staff members of both the Galerij Prins Willem V and the Mauritshuis museum for the kind hospitality as well as the marvellous co-operation to make this very special and exceptional in-situ project possible. 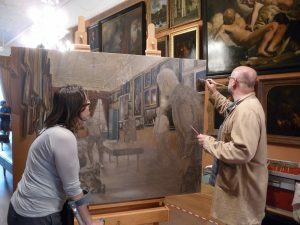 Although, from this moment on, the subsequent execution of the coming phases of the DIOGENES painting will be performed in the isolation of the studio again, of course its step-by-step documentation on this blog will be continued.